On Saturday, June 21 some 8000 people decided it was a perfect day for an airshow in Northern California, and they all came to San Carlos KSQL just 15 miles from San Francisco. The event is called Vertical Challenge, and it's unusual primarily for the aircraft: They're all vertical takeoff and landing types. 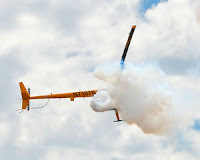 This is appropriate in that the sponsoring agency is the Hiller Aviation Museum. Stanley Hiller founded Hiller Helicopter nearby, and over the years accumulated an amazing "attic." 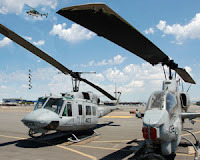 This was the ninth time the event has been held, and the range and number of VTOL machines are increasing. There were the usual parachute drops and fly-by's, but the real eye-opener was the aerobatic demonstration by the Red Bull machine. 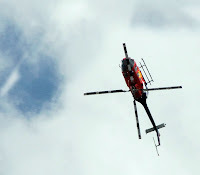 It's not often one sees a rotary-wing aircraft doing loops and rolls. With a dozen static displays of military equipment there was ample opportunity to chat with the crews and sit in the Blackhawks and Cobras. The museum itself was open for the price of admission to the show and included a half-dozen flight-sim stations that were so popular that start-time tickets were being issued. 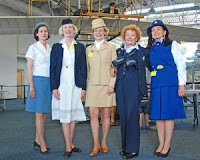 Ten members of the PanAm Flight Attendants club were there in their original uniforms dating back to as early as 1949. One quipped that anytime it won't fit she goes on a diet. Go to www.hiller.org for information about next year's show.